Why does Lucifer dress so badly? Technically, he’s a figment of Sam’s imagination, right? He could dress any way Sam likes, and you’d think that Sam would figure he could dress any way he liked, because, imaginary or not, he’s Lucifer! Why does Sam imagine that he’d always look like a trucker who just staggered in the door at five in the morning and collapsed in a chair to postpone the inevitable appointment with his own laundry? In the popular imagination, hasn’t the devil usually been depicted as having a taste for luxury and a certain amount of fashion sense? Of course, Sam doesn’t like Lucifer and is supposed to be coming apart at the seams from the stress of thinking that he’s always around. Maybe he imagines him as looking dingy as a form of revenge. On the other hand, since the Winchester boys are so proud of their own grungy, blue-collar roots, you might think that picturing Lucifer as if he worked for a living and has always just gotten off the night shift might be Sam’s way of conferring respect on him. If Sam really hates Lucifer as much as he claims to, he ought to imagine him as a pretentious dandy wearing spats and driving gloves and twirling a diamond-handled cane. One finds oneself thinking about such things on certain nights while watching Supernatural, and when one does, it’s never a good sign. Tonight we got the episode I was anticipating, with gritted teeth, last week, with Sam in the nuthouse. He does everything one might have expected him to do there. He tries to ignore Lucifer, who is sitting nearby, unseen by anyone else, dropping lame wisecracks and doing his best to annoy him. He gets the strung-out heebie-jeebies from going without sleep. He has little chats with people who aren’t Lucifer, chats in which these people begin saying crazy, unsettling things, and then he gets to gasp and jump back when the CGI morphing effects kick in and it turns out that, ha-ha, he really is talking to Lucifer after all. He even takes a bite out a sandwich and then retches and throws it on the floor after seeing that, to his deranged eyes, it’s swarming with maggots, a scene that recalls Bart Simpson dropping a firecracker down the school toilet and saying, “I’ve got a weakness for the classics.” Sam does his best to look surprised while doing all these things; he even looks as if he’s caught completely off guard when the guy who wheels him into the electroshock therapy room and hooks him up like a car battery suddenly reveals that he is, ta-da!, a demon. I know the Winchesters’ schedule keeps them on the road a lot, but they’d be a lot better prepared for some of the surprises waiting for them if they watched more TV. Maybe the writers figured they didn’t have to work too hard on Sam’s scenes because they already had this episode’s ace in the hole—the return of Castiel. Dean finds him almost by accident, while beating the bushes in hopes of finding someone who can help him get Sam back in working order. He learns about a mysterious figure called Emanuel who can “heal the sick and cure the crazy,” and heads straight for the miracle worker’s address. The miracle worker is, of course, our Cass, though he’s been stricken with amnesia and doesn’t know who he is or how he can do the things he does. It says a lot about how much I’d rather watch Misha Collins, even in shell-shocked amnesia victim mode, than watch Sam melt down in front of a smirking Mark Pellegrino, that this half of the show was the half I found more tolerable, even though amnesia may be the only TV trope I can think of that has left life left in it than sticking someone in a rubber room. Collins and Jensen Ackles have some nicely handled scenes in which Cass asks Dean why he’s so angry and Dean, who doesn’t want to risk Cass taking it badly if his memory returns, talking around the fact that he’s miffed partly because he blames Cass for Sam’s condition. But even after Meg shows up and joins the party, there isn’t much to do except wait for Cass to start having flashbacks and see how he responds to them. (In the meantime, longtime viewers may be having flashbacks themselves, to the episodes featuring Julie McNiven as Anna Milton, who had both the “falsely diagnosed with mental illness and locked up” thing and the “angel with amnesia” thing going on. It’s probably inevitable that, as Supernatural keeps getting more and more long in the tooth, it’s going to becomes more and more shameless about recycling previously used story and character devices, including the ones that weren’t all that fresh to begin with. 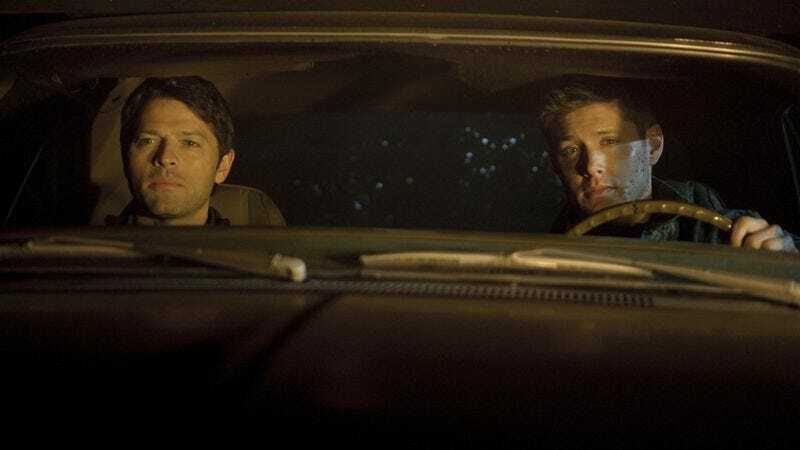 So rather than get too bent out of shape about this, I’ll count my blessings and just be grateful that at no point did Dean and Castiel get busy together in the back of the Impala. In the end, Cass remembers who he is, feels just awful about it, wastes some demons—”It’s in there,” Dean reassures him before sending him into battle. “I’m sure it’s just like riding a bike.” “I don’t know how to do that either,” says Cass—and then, in the final big, dramatic non-surprise of the evening, performs a redemptive sacrificial gesture and cures Sam by taking his craziness from him and keeping it for himself. We last see him zonked out in the mental hospital while Sam and Dean ride off together into the sunset, preparing to do battle with whatever is down the road without the help of their angel terminator friend, or hardly anybody else, since, as Dean points out at one point, they’re once again at that awkward place where pretty much all their friends are dead and they haven’t made any new ones yet. Meg is seen getting a job at the hospital so she can stick around and keep an eye on Cass, and maybe this, and some of the other loose ends blithely left to flap in the breeze, will provide the set-up for something that’ll develop farther down the line. For now, though, the ending feels like an attempt to bring Castiel back just long enough for him to atone for his past misdeeds and bring closure to viewers who are still pissed off about the abrupt (and brave) way the show dispatched him early in the season. In that, it was fairly successful. Everything else about it was stale dishwater.